Macroeconomics is an empirical subject, meaning that it is verifiable by observation or experience rather than just theory. Given this, the first step toward understanding macroeconomic concepts is to measure the economy. How large is the U.S. economy? The size of a nation’s overall economy is typically measured by its gross domestic product (GDP), which is the value of all final goods and services produced within a country in a given year. The measurement of GDP involves counting up the production of millions of different goods and services—smart phones, cars, music downloads, computers, steel, bananas, college educations, and all other new goods and services produced in the current year—and summing them into a total dollar value. This task is conceptually straightforward: take the quantity of everything produced, multiply it by the price at which each product sold, and add up the total. In 2016, the U.S. GDP totaled $18.6 trillion, the largest GDP in the world. Figure 1. 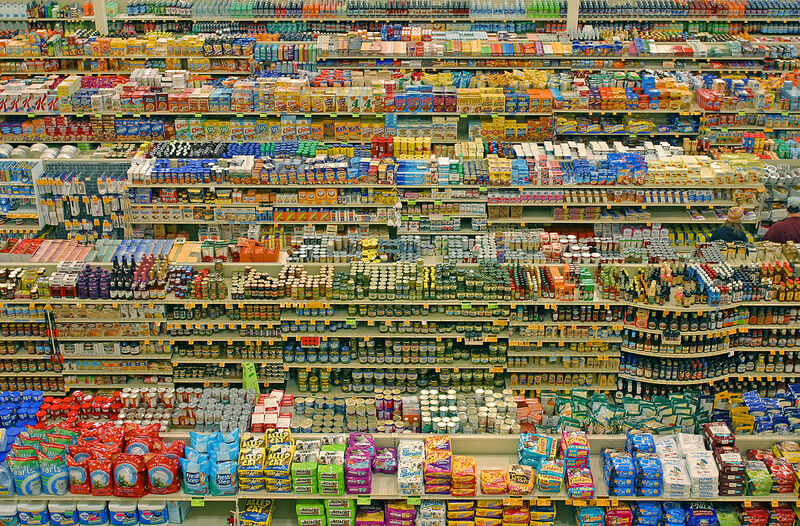 These packaged foods and other products in a grocery store make up just a small sampling of all the goods and services in an economy. GDP is defined as the current value of all final goods and services produced in a nation in a year. What are final goods? They are goods or services at their furthest stage of production at the end of a year. Statisticians who calculate GDP must avoid the mistake of double counting, in which output is counted more than once as it travels through the stages of production. For example, imagine what would happen if government statisticians first counted the value of tires produced by a tire manufacturer, and then counted the value of a new truck sold by an automaker that contains those tires. In this example, the value of the tires would have been counted twice-because the value of the truck already includes the value of the tires. To avoid this problem, which would overstate the size of the economy considerably, when government statisticians compute the GDP at the end of the year, they count just the value of final goods and services in the chain of production. Intermediate goods, which are goods that are used in the production of other goods, are excluded from GDP calculations. From the example above, government statisticians would count the value of the truck plus the value of any tires that were produced but not yet put on trucks, since at the end of the year, those tires are counted as final goods. Next year, when the tires are put on new trucks, GDP will include the value of the new trucks less the value of the tires that were counted this year. If this sounds complicated, remember the point is to only count things that get produced once. What is counted in GDP? Intermediate goods that have not yet been used in final goods and services. Raw materials that have been produced, but not yet used in the production of intermediate or final goods. What is not included in GDP? Notice the items that are not counted into GDP, as outlined in the list above. The sales of used goods are not included because they were produced in a previous year and are part of that year’s GDP. Transfer payments are payments by the government to individuals, such as Social Security. Transfers are not included in GDP, because they do not represent production. Production of non-marketed goods and services—such as home production like when you clean your home—is not counted because these services are not sold in the marketplace. By contrast, if you hire Merry Maids to clean your home, your payments do count as part of GDP, because the transaction is counted as going through the marketplace. Finally, the entire underground economy of services paid “under the table” as well as any other illegal sales should be counted, but are not, because they are not reported in any way. In a recent study by Friedrich Schneider of Shadow Economies, the underground economy in the United States was estimated to be 6.6% of GDP, or close to $2 trillion dollars in 2013 alone. Economists generally estimate GDP using a method called the Expenditure Approach. Let’s explore that next. Watch this explanation of what GDP is and what is included (and not included) when it is measured. You’ll learn more details about each of these components of GDP soon.